December brings out the giving spirit. There are many options for people who want to get involved helping the homeless in local communities. Be a Santa to a pet that belongs to a homeless person. Be a Santa to a pet. December brings out the giving spirit. There are many options for people who want to get involved helping the homeless in local communities. This year help a pet that belongs to a homeless person by donating pet food, leashes, collars or toys to a local collection site. 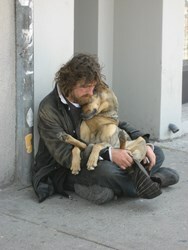 Sites are listed at the Pets of the Homeless website. Or you can make a monetary donation at the website that will be used for emergency veterinary care for a pet in need or for one of the many wellness clinics that Pets of the Homeless sponsors every year. $7.79 will feed and provide basic vet care for an average size dog for a day. All donations are tax deductible. For details, visit http://www.petsofthehomeless.org. About Pets of the Homeless, a national nonprofit since 2008, collection sites have collected over 234 tons of pet food and supplies and taken to food banks, soup kitchens and homeless camps. Over $145,000 has been used for illnesses and injuries to pets that belong to the homeless across the country.